This week's tablehopper: city mouse, country mouse. 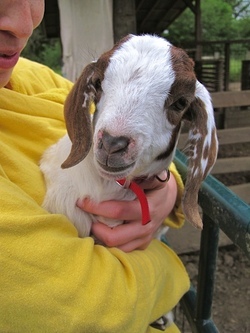 Meet Lily, the sweetest little goat you ever did see. Photo: © tablehopper.com. Man, was it good to get outta Dodge for 24 hours. I was honored to be invited by my friend to visit Roshambo Farms, just off Westside Road in Healdsburg. Springtime in Sonoma is the best—we got to tour the farm, walk through the fields, play with the chickens and turkeys and goats and sheep and pigs and cats, and have an amazing home-cooked dinner with vegetables and wine from the land (and yes, there was some goat, and bacon, too). I am going to savor each and every farm-fresh egg I brought home, let me tell you. Also had a fab (as ever) lunch at Diavola in Geyserville before heading home—chef-owner Dino Bugica has a close relationship with Roshambo, so it was cool to go full-circle with the ingredients from the farm. The highlight, however, was meeting Lily, this precious little goat who was abandoned by her mother at birth, and is currently being bottle-fed around the clock by my friends. She was an adorable shadow, following us everywhere, hopping and twisting in that hilarious goaty way, and bleating when she was tired and didn’t want to walk anymore. Heart=melted. Big thanks to Timothy and Naomi for having me and my friend up for the night, what a delight. Apropos of the 707, Deirdre Bourdet has a 707 Scout piece for you today about where to eat on Mother’s Day (I’ll have some 415 spots for you on Tuesday). Well, yours truly has a ton of catch-up to do, so here’s wishing you a fab weekend. The weather is purty, so I thought I’d run a piece on one of my favorite places to eat alfresco: Gitane. Enjoy!